All Translators I know are consummate professionals, who take great pride in the quality of their work. They are well-used to using various sources of reference material to ensure they meet the expectations of their customers, and they systematically proof read their work before delivery. Most of them use CAT tools, which allow them to maximise consistency and partly automate quality control. Translation agencies and Language Service Providers all offer what is known as TEP, Translating, Editing and Proofreading, as their most basic level of service. TEP provides a systematic Quality Assurance process, often involving several linguists with various levels of seniority. And yet independent linguistic review services are one of the most dynamic sectors in our industry. This article explains why it is so successful and what you should take into consideration if you are ready to take this particular plunge. I am not always a strong supporter of outsourcing, but in the case of linguistic review there are compelling arguments in its favour. Let’s first ask ourselves, who typically are the in-house reviewers? Two of the most common categories are linguists on one hand, and in-country Marketing and Brand staff on the other. It can be difficult for a company which purchases translation services to keep dedicated linguists in full-time employment. Product releases are often seasonal, or at least vary in pace from one month to the next, and the associated translation requirements follow the development cycles. By opposition, it may be difficult for in-country staff who are not linguists to commit to Localisation schedules. Review is a secondary task for them and they cannot drop everything else when review activity peaks. Moreover, they are unlikely to have the tools and skills a professional linguist employs. staff working on multiple accounts so they are easily redeployed when you do not need them full-time. 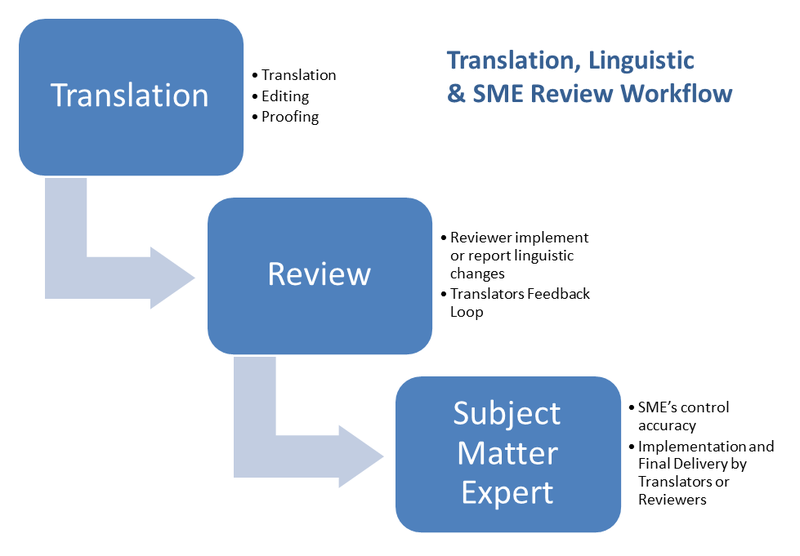 Sectors like the Life Science or the heavy vehicle industries also even require SME’s (Subject Matter Expert) as an alternative or even additional Review step to ensure your translations are not only of the highest quality in linguistic terms, but technically and legally accurate. Professional review services use customisable error categorisation. Often based on the LISA model, they are used to classify errors and better decide corrective and preventative actions. Measuring quality requires clearly defined and pre-agreed criteria, independence of the rator and historic data analysis so judgments can be made according to trends and not just levels. Like for categorisation, error rating is often based on industry standard classifications like the LISA QA Model. The reviewer inputs the rating for each error found. This is mostly reported using QA report spread sheets but can also be fully integrated in Workflow technology such as WorldServer or SDL TMS. Each rating is associated with a number of points which is often deducted from a starting score of 100%. A score can then be calculated for a project, job or sample. A Pass/Fail rate can even be decided in advance, with the Fails prompting for different levels of corrective actions, especially if they are repeated. Implementation may be the responsibility of the Translator or the Reviewer. Letting the Translators implement the changes, ensures they are aware of every change recommended by the Reviewer. On another hand, allowing the Reviewer to implement their own changes speeds up the overall process because the translation does not have to “change hands” again before it is delivered. Whatever the choice is, a solid arbitration process must be in place. Translators must have an opportunity to discuss the Reviewer’s recommendations but it is advisable to set in advance the number of times this feedback loop is allowed to happen on a particular project, or the schedule will be affected by excessive discussions. In the case of repeated concerns with one language or one set of Translators an escalation of the corrective actions may be needed. This may take the shape of closer collaboration between Translators and Reviewers, detailed training and improvement plans. Change in personnel or similar sanctions can occur as a last resort. 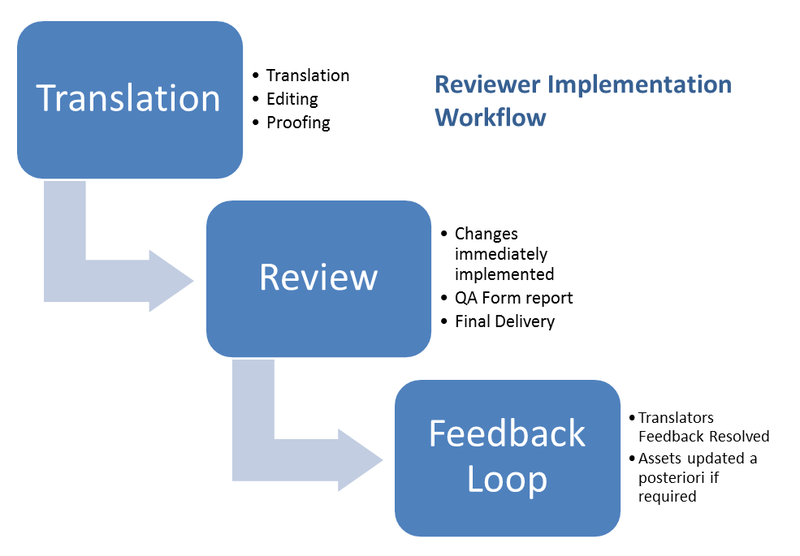 Reviewers can bring a great amount of value to a translation process by taking part during the translation process rather than only afterwards. Think of it a prevention instead of cure. 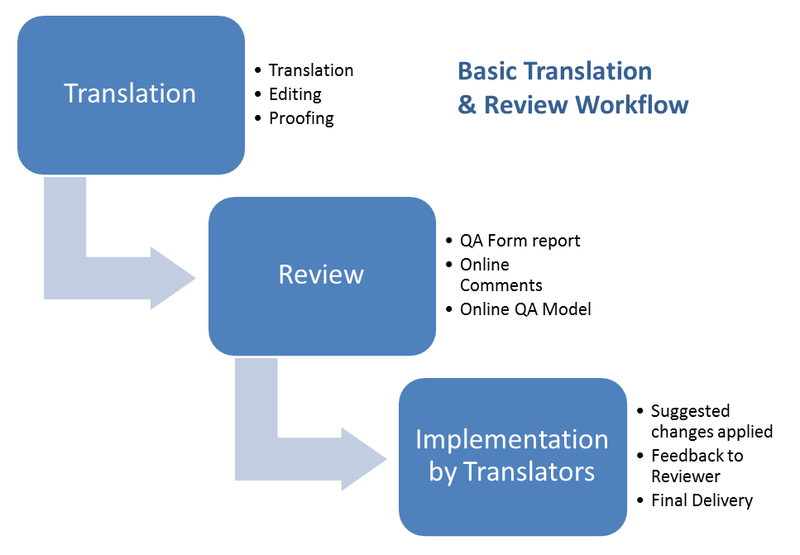 An efficient Query process promotes communication between Reviewers and Translators, and enables the Translators to consult with the Reviewer during the translation process. The aim is to avoid their having to make decisions which may or may not be approved during Review. The challenge in setting this up is that the Reviewer’s work becomes more difficult to measure and price. 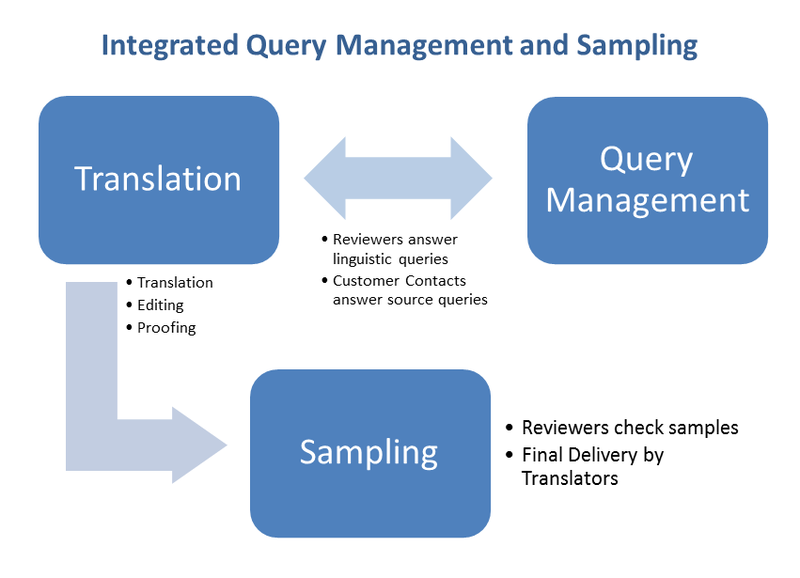 However, the use of a Query database should allow linguists to research previously answered Queries and compensate Reviewers based on the number of Queries answered. A slightly different process needs to be setup for Source Queries. Answering those questions about the source text, may be an area where your in-country Brand and Marketing staff as well as content creators and other stakeholders remain involved with the Translation supply chain. Ideally this should happen through the same Query database as Linguistic Queries. Reviewers may also be the ideal people to have the responsibility for maintaining Linguistic Assets such as Glossaries, Translation Memories or Style guides. While Translators are the first linguists to get exposed to new content, the Reviewers should have a more global overview of your content, particularly if you use more than one LSP. A suggestion process is required for Translators to request new Terminology, Global changes in legacy translations or standardisation through Style guide updates. But the Reviewers are likely to be the only ones who can coordinate feedback from multiple sources. Professional Reviewers are experienced Translators and they often double-up as Terminologists. For this to be succesful, it is essential to have a central repository where all involved can access the latest version of each piece of reference material at any time. This can be a Translation Management System or a separate repository like SharePoint, eRoom etc. It should prevent the use of local copies as much as possible, and an email notification system can be used to advertise updates at least for the more stable elements like the Style guides. The update process may also need to be scheduled with clear cut-off and update publication dates if failure to comply results in errors measurable during Review. Reviewers are usually experienced Translators and the hourly cost of a Reviewer can be substantially higher than that of a Translator. This is easily offset by the value they bring if the process is setup correctly, even if you don’t move from a setup where review was done by in-house staff. Professional review will lower the volume and therefore cost of error fixing. It will increase the quality and consistency of your content, and reenforce in-country brand integrity. In more mature translation chains, the ratings are sometimes used to target languages where full review is required versus those where sampling might be enough because quality has been observed to be consistently high. In such cases, the make-up of the Reviewers role should transition to less review work and more production support activity through Query and Asset Management.